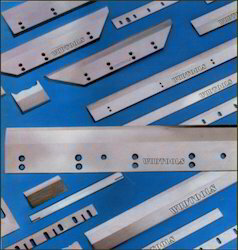 Wudtools manufacturers Knives for Converting Industries. This is only as adapter to Top Cutters. Available in different sizes to suit various locking arrangements. With spring circlip and key, wherever required. AISI - SAE 52100 / 01 / AISI - D2 H.S.S. 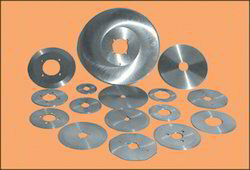 Wudtools manufactures a complete range of Circular Knives for varied applications industry wise. Hundreds of sizes, many from stock. 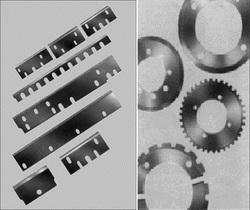 We offer range upto 600Ø (24"Ø) in various forms, various cutting angles, with or without perforations. Note: For various application suitable material is used from widely available following material. Tungsten Carbide Powder Metallurgical Steel, etc. As per the machines and their different models, our knives are ordered as replacement on various machines like Atlas, Como, Harris, Maxima, Perfecta, Polar, Muller-Martini, Wohlenberg, etc. High Carbon Steel / AISI - D2 / HSS-inlay / TC-inlaid. Generally used in the Paper Mills for cut-to-length Paper Sheets. Wudtools range starts from 500 mm (20") to 4000 mm (160") with various types of cutting Angles. We have capacity to produce sheet cutter upto 4 meters in length. Depending upon the requirement of the customer, to their drawing, this is manufactured. Wudtools is well known manufacturers and supplier of web press serrated edge cut-off knives. You name it, we can provide it. Whether your press is domestic or foreign built, you can always count on us for availability, fast response, and performance. Machined and precision ground to OEM specifications. 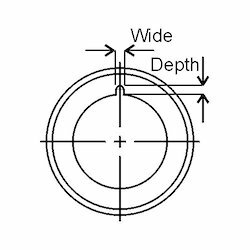 From ground tooth profiles assure consistent size and burr-free cutting edges. 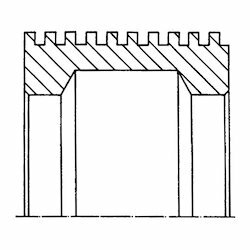 Tooth forms in Rip Saws, V-Tooth and Herringbone styles serrated and bevelled, on one or both sides. Over 40 types in 8, 10, 12 and 16 teeth per inch. Custom designs manufactured to order. Special sizes and custom knives are made to your specifications. Firm prices and prompt deliveries are offered by us. We are one of the most prominent manufacturer, exporter, distributor, wholesaler, trader, & supplier of excellent quality Bottom Slitter Blades. 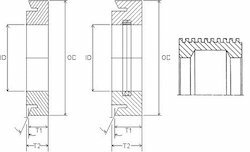 The offered bottom cutter females are specifically processed with top-notch components and newest ideas of developing keeping in mind ever the well defined requirements. Also, these bottom cutter females are known for their user friendliness & long life. 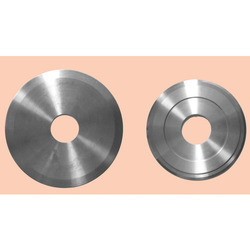 Besides, we present these bottom cutter females customization options to choose from only at suitable rates. Wudtoosl is well known manufacturer and supplier of Asbestos Cutting Knives. We manfacture Asbestos Cutter using high grade Steel. We are one of the pioneers in traditional Alloy steel knives for wet Asbestos Cement Sheet cutting. We can offer the same in HSS and High Carbon high Chromium Steel (C = 2.1, Cr = 12%). APPLICATION: Wet Asbestos Cement Sheet cutting. Following are some of the common sizes but we can make any size required. Wudtools's 'Carbcut' Carbide Segmented Bevel Knives have been developed over a number of years and have an excellent and proven track record. The circular knife consists of a steel body plat fitted with bevel edge tungsten carbide segments - each segment being pinned for increased operating safety. Wudtools's Hard Metal Division, recommend that the maximum operating speed as 4000 rpm, although each blade is test run at speeds of 6000 rpm prior to despatch. 'Carbcut' Carbide Knives are primarily designed for the cutting of asbestos and its substitute, a wet fibre cement, plus a wide range of other composite boards and panels. Also in the new development made by our hard metal division now we can also offer you the complete ring configuration specially for wet fibre cement and composite boards. 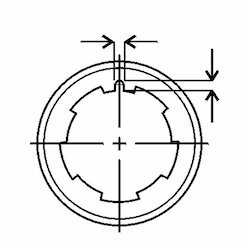 This will substitute the configuration of Carbide Segment with One Carbide Ring configuration. Wudtools provides various special blades and knives that find applications in hundreds of industries as well as in handicraft and utility gadgets. Wudtools provides 'technical' blades for production, cutting and slitting of plastic films, rubber products, textiles, fibres, leather, glassware, cardboard, paper, web cut-off, packaging, pencil sharpeners, etc. However, we provide special blades for applications that fall outside the standard range. Blades illustrated in this catalogue are produced with "hair cutting sharpness". You will find most of your applications in this catalogue and we will be happy provide them require your consolidated schedule of requirement for regular supplies. Call on us with specific application, quantities and details of what you are using presently. We will try to give you your exact requirement or help you to choose from our nearest standards so that you can always procure them easily from us. Various Industrial Razor Knives : ?? With huge years of industry experience, we are offering Dish Knives for Aluminium Foil Slitting. The offered Dish Knives for Aluminium Foil Slitting are specifically processed with top-notch components and newest ideas of developing keeping in mind ever the well defined requirements. Also, these top cutters are known for their user friendliness & long life. Looking for KNIVES FOR CONVERTING INDUSTRIES ?